Mumbai: The Government of Maharashtra, National Cancer Grid, Tata Memorial Centre, the Government of India’s Department of Atomic Energy, and Tata Trusts today organised Maharashtra’s first Virtual Tumour Board (VTB) meeting, connecting the state’s government medical colleges to provide access to expert opinion to cancer patients from the state’s remotest corners from a multi-disciplinary panel of cancer experts from across the country. The VTB launch witnessed participation from 13 government medical colleges, Tata Memorial Hospital and other hospital members of the National Cancer Grid. The inaugural session took place in the presence of Shri Girish Mahajan, Hon’ble Minister for Medical Education, Maharashtra. Mr. R. Venkataramanan, Managing Trustee, Tata Trusts, said, “There is an acute shortage of skilled manpower, especially oncologists, in the country to provide adequate care to the 14.5 lakh new cancer cases every year. Today, we move beyond our conventional ways of working and remote care models like this will go a long way to promote use of technology to decentralize cancer treatment and hence enable access to high quality cancer care in the state’s remotest corners. Burzis Taraporevala, CFO and Company Secretary, Tata Trusts, said, “The National Cancer Grid which was started about 5 years ago is responsible for connecting various hospitals towards improved cancer care. In these five years, we have through Internet connectivity and bandwidth connected about 120 hospitals and cancer care units. This pioneering effort by the Maharashtra Government aims to provide both evidence based cancer care and upgrade skills and knowledge of clinical staff, in line with the Prime Minister, Mr. Nardenra Modi, and the Chief Minister, Mr. Devendra Fadnavis’ thrust to enhance research capability and capacity in the sector. The initiative is being led by the National Cancer Grid (NCG), an initiative of the Tata Memorial Centre and Department of Atomic Energy, which is a network of 124 major cancer centres in the country with the mandate of establishing uniform standards of patient care for prevention, diagnosis and treatment of cancer, providing specialized training and education in oncology and facilitating collaborative research in cancer. 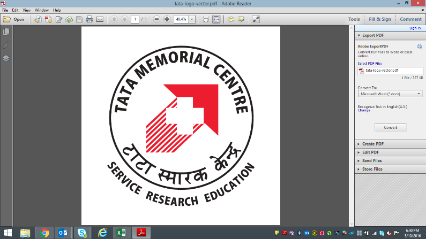 Tata Trusts are providing the National Cancer Grid centres and the Government Medical Colleges in Maharashtra with high bandwidth enterprise level connection. This will enable the colleges to fully utilize and benefit from various NCG initiatives including the Virtual Tumour Board, NCG Digital Library, e-resources and publications to name a few. The VTB comprises of experts from the fields of medical oncology, radiation oncology, surgical oncology, anaesthesiology, pathology, imaging technology as well as others leading government-run and private hospitals. The VTB establishes a platform where complicated cases of cancer patients are discussed through a multipoint video conference to get opinions on diagnosis and treatment. The discussions are web-based and conducted every Saturday where some centres present the cases while others give their opinions. This enables hospitals even in remote areas to access opinions from leading experts in the country. The ultimate goal is to eventually reduce the need for patients to travel to major cities while contributing to the garnering of knowledge for developing contextual, locally appropriate, peer reviewed protocols, policies and guidelines for the state and for the nation.